Below are entries from 2011 for construction of the new concession stand. Hope you enjoy seeing the start...to finish! 2011 will be an exciting year for the Elkhart County 4H Dairy Feeder Calf Club. Plans are being made and construction to begin soon on our new concession stand. Lots of hours have already been put in already. Special thanks to Lydell Troyer for all of his time. As well as the folks at DJ Construction for their help in this process. If you are involved in a construction trade, and would like to volunteer some labor, please contact Lydell Troyer, Doug Bobeck, or Jody Lengacher. Update 3/14/11: Financing is now in place! Permits are pulled! Construction to begin soon! Area is staked out and ready for the dirt work to begin. Site is prepped! The excitement is building as we approach the construction of this long awaited project! Update 3/31/11: The construction has begun! Another picture after the posts are in place. The rough-in plumbing is in place. Also, truss are onsite. The roof sheeting is up! Ready for metal! The concrete floor has been poured. The metal is on the roof. The metal is being installed. The ceiling over the the dining area is complete and some of the walls are covered as well. The picture on the right shows the serving window for the drinks only line......and our special treat! Progress continues on our building. The kitchen area metal is all up. The electrical and plumbing is in progress. Progress continues on our fantastic new concession stand! The stamped concrete has been poured for the approach and sidewalks. Thanks to JM Concrete Concepts! The lights have been installed in the eating area (picture on right). Update 6/13/11: Advisory Board and Leaders are hard at work! The Advisory board and leaders had another work night, after the monthly advisory board meeting. The drywall is installed and now the FRP will be adhered to the walls and ceiling. Make sure to contact a leader or advisory board member if you would like to help! Interior work continues on the concession building. Update 6/17/11: Club Members get involved! 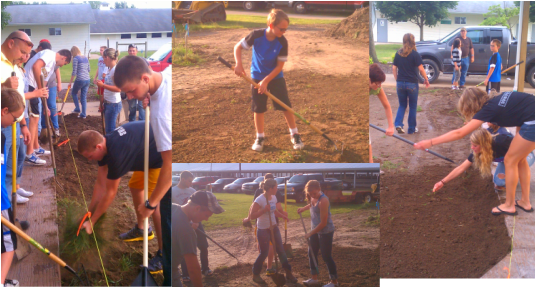 After the regular meeting, last night, several members stayed to help rake and shovel the dirt around the concession stand. Thanks to all who helped! Update 7/6/11: It's getting closer! The concession stand is getting closer to completion. The interior is nearly finished. Also, equipment has begun to arrive and be hooked up. The counter tops are in and the counter shutters are installed. We are ready to go! The new tables are in and chairs are in place! Update 7/20/11: Ribbon cutting and grand opening! Tonight we held our grand opening. Fairboard president, Renee Troyer Campbell, cut the ribbon for us. The Executive and Long Range Committee's were treated to Haystack's and Razzle's. We appreciate their help in getting this fantastic concession stand and location.